MineDecor cupcake holder can bring up to 36 of them wherever you need to go! This versatile, convenient device keeps baked goods safe, secure, fresh, and delicious with three detachable, modifiable tiers. The cupcake holder tray comes out to store other foods like cakes or cookies. Made of premium thick durable BPA-free PP material. Reusable and completely safe for refrigerator, freezer, and dishwasher use. Dimention: 14.2" x 10.4" x 12.5"(L*W*H). EACH TIER: 14.2" x 10.4" x 3.9"(L*W*H). EACH SMALL TRAY: 2.16"(Dia).Sturdy handle, we can carry this cupcake tray for going out with ease. 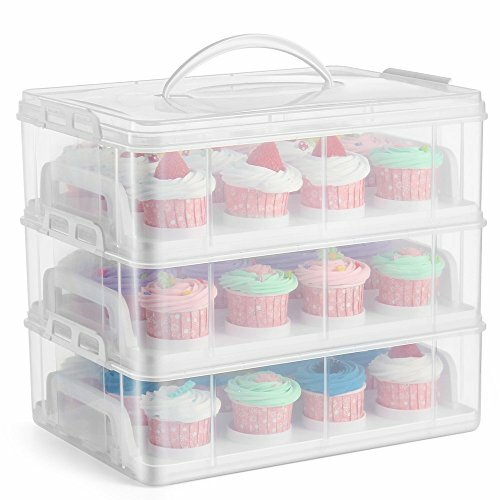 The flexible stacking system of our Cupcake Case has 3 different tiered compartments that allow us to take a dozen cupcakes in a single rectangular case or up to three dozen to your parties! Our three-tier cake/cookies/muffin/dessert/bread/pies/cupcake transporter keeps our delicate baked goods fresh and safe. Our 3 layer rectangle cupcake tray is very handy for picnic/birthday party/Christmas/hosting event/school/office/potlucks. View More In Cupcake Carriers. If you have any questions about this product by MineDecor, contact us by completing and submitting the form below. If you are looking for a specif part number, please include it with your message. 6" Deep Square Hinge Container, 500 ct.
1/2 Dozen Cupcake Container (6 cavities), 100 ct.
6" Shallow Pie Hinge Container, 25 ct.